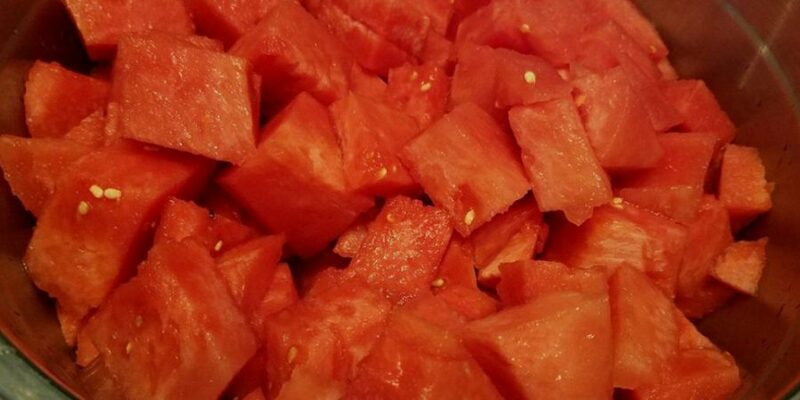 Confession: I love watermelon, and I love to cut it up. Ideally, I like to eat it in gorgeous triangles off the rind. But that’s not always practical, such as when adding watermelon to a bowl of other fruit, or when transporting large amounts of it to a picnic, or when wanting to eat it without juice running down your elbows. Little times like that. So I also like bite-sized pieces, all ready to go. Here’s a simple method that I’ve had fun creating and playing with, in which the rind itself becomes the cutting board for watermelon cubes. Plus it’s fun to dump the pieces out. Plus I get to work with video, and with my son. Hehee. That is my favorite way to cut watermelon as well. It works well for little hands too! Where has this been all my life?? We might just have watermelon more often now!! Thanks ? The best part is your giggle when a few cubes missed the bowl!!?? I like the cameo appearance by the watermelon inspector. I love your videos!!! ❤️ My favorite part is that whack at the beginning. ?? Any ideas on choosing a nice crunchy watermelon? I always seem to get the mushy/sandy watermelons. ? I’m one of those odd people that you see knocking on watermelons at the store, but actually haven’t a clue what I’m doing. Grr. You and me both! I knock but no one answers. I’ve heard all these specific tests, like check for a yellow patch on the melon rind to show it ripened in the sun (that patch didn’t get any), knock for a hollow sound, etc etc… but as far as I can tell, every watermelon is kinda alike. In the end, I take the one that calls my name and hope for the best. At last! Something concrete! 🙂 I will be giving this a try. I am most interested in the costume change between the second and third portions… is that necessary to the success of the project? That is possibly the most important part of all!! Lol. No, in my defense I must testify that they come out nice and even each time! BUT – baby heads popping up, apparently inches from the knife blade, while Mother continues rolling and talking is a little more alarming. I promise it wasn’t as close as it looked, but it looked awful! Very cool! Dont feel bad for not knowing Shari, after almost 57 years, I will be trying this. ? Loved the video: pop up, change up, and giggle up! ? Loved this! Now to get some watermelon ? Ahhhhh… so glad for this. Thanks. My goodness you did that so quickly! I’m going to have to try your technique Shari. Thanks for the laughter of changing dresses and bowls too. lol? This made me giggle. Thanks Shari! I needed a lighthearted break this day… and maybe some watermelon too… where’s my watermelon?? Clever. I am always up to trying to time saving methods for food prep. Hey! I tried your cutting watermelon tip and it worked like a charm. Surprise. 🙂 I had to chuckle when some of my watermelon also refused to go into the bowl. 😮 Thanks for sharing.